I’ve been procrastinating on writing a blog post for a while because it just seemed too daunting. A few weeks ago, my dad and I took a two week road trip across Normandy and Brittany, France. And I thought I took a lot of photos, but it was nothing compared to how many he took! I finallllly got around to downloading my pictures onto the computer, and so now the process of sorting and writing can begin in earnest. I’m going to break down our trip into tiny chunks so as not to overwhelm you or myself. 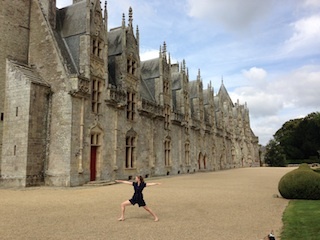 So here is part one: Yoga Across Brittany, France. 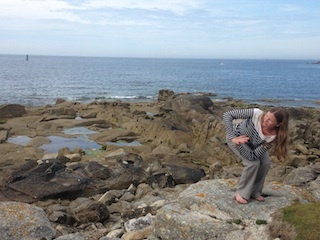 As most of you know, I practice and teach yoga, so I thought it would be a fun idea to take pictures of me doing different yoga poses at interesting locations along our route. Some of the poses relate to the spots where we are, some mimic the shape of the scenery, and some are a bit random. We didn’t take yoga pics in all the places we stopped, and I’ve ordered them to match with the path we took so you can follow along our travels. And so we’re off to Brittany….the region that encompasses the Western-most part of France. The spout, if you think of France as the shape of a tea kettle. Saint Malo: A walled town sitting on the northern shores of France, on the English Channel and at the mouth of the Rance river. Known for its privateer (aka pirate) history, St. Malo is now a big tourist destination and beach town. 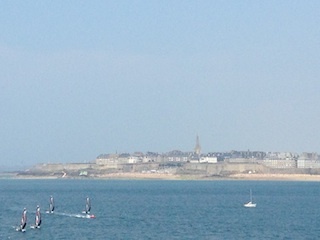 View of St. Malo across the mouth of the Rance from Dinard. 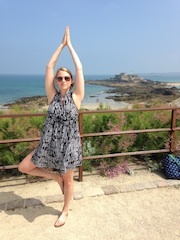 Tree pose (vrksasana) on the ramparts of St. Malo overlooking one of the town’s old fortifications. 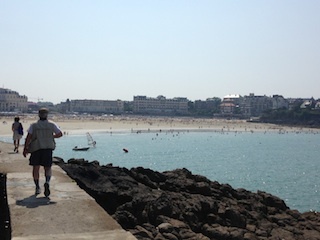 Dinard: Founded as a beach retreat for the rich and famous, now just a super crowded beach town with a casino that’s pretty on the outside and sad-feeling on the inside. We were told by numerous people that they don’t get a lot of American tourists, so we were a novelty to the shopkeepers. We walked along a cliffside promenade that edged town all the way around to the biggest beach. Side angle pose at the dock. Currently low tide. The water was a gorgeous turquoise-green color. Trying to mimic the sail boat masts with this pose. 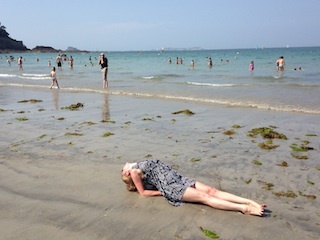 Fish pose at the beach in Dinard. Of course. Ile de Batz: We took a ferry from the beach resort town of Roscoff to the tiny Ile de Batz in the English Channel, where we marched to the lighthouse. The island is about 8km around, and we didn’t walk the whole thing as we took a late afternoon trip there. 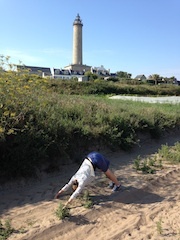 Downward facing dog at the lighthouse. Opposite the lighthouse was a secluded beach down a steep embankment with tons of backpackers’ tents and bonfires. 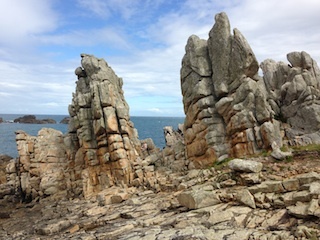 Plouarzel: Seriously off the beaten path, a super tiny beach town outside of Brest. We went because we had seen a sign for the Foie des Pinseyeurs – basically a fishermen festival. It ended up being three small tents and picnic tables, as well as some lawn games. Needless to say we were the only Americans, and actually probably the only tourists, as it seemed to be a tight-knit community group of fishermen and their families/neighbors. Twisted chair on this rocky cliff. Note the high water markings on the rocks. Yes? No? I’m perched on a rock in that V between to the two tall peaks. 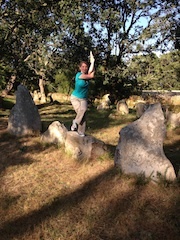 Carnac: Best known for the megaliths, Carnac also has a surprisingly awesome beach town. If it weren’t so hard to get to, I’d would totally want to go back and rent a beach house with a bunch of friends. Or we could just go to Ocean City I guess. The megaliths are definitely nowhere near a big as Stonehenge but there are a ton of them spread out over a large swath of land. No one really knows why the prehistoric people put those huge rocks in those rows. Most were roped off from visitors, but we found a beautiful wooded site off the beaten path with no one around where you could meander through the formations. 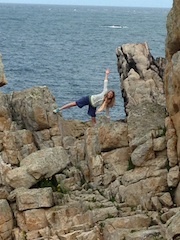 Eagle balancing on a smallish megalith. Josselin – This medieval town has an impressive castle that’s a mixture of medieval and Breton Renaissance styles (because it has been torn down in pieces many times). It is the historic home of the Rohan family whose members still inhabit it when they aren’t in Paris. 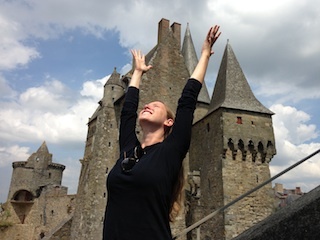 Warrior II (virabhadrasana II) in front of the massive castle because castles probably should have some warrior guards, right? Vitré – A walled town with another famous 11c castle that was rebuilt during the 12-1400s. One of the castle’s buildings is now a museum with various unrelated objects, and another of the interior buildings is the town hall. Urdhva hastasana mimicking those tall towers. Nantes – Our last stop to one of the largest cities in Brittany. An enormous cathedral and another castle of course. 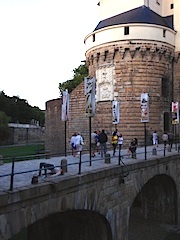 Surrounded by a (now mostly dry) moat, the castle houses a museum and a cafe. Bridge pose on the castle bridge. Don’t take all these poses as the best representation or fullest form….when you’re hustling to strike a pose amongst a crowd of people or precariously perched atop a rock, it can’t always be the best. Next onto some other aspects of this fabulous trip….